Special bits that fit our Magna-Tip® and Clip-Tip handles to correctly center the blade and fully support 1911 grip bushings. Makes removal easier, faster and prevents tearing up the slot. Regular 1911 Bushing Driver Bit removes standard bushings. Slim 1911 Bushing Driver Bit removes the thin bushings used for slim grips. SPECS: 1-9/16" (3.9cm) overall length, ¼" (6.35mm) O.D. Spesielle biter som passer våre Magna-Tip ® og klipp-spissen referanser til riktig center bladet og støtter 1911 grep foringer. Gjør fjerning enklere, raskere og hindrer rive opp sporet. Vanlig 1911 foring Driver Bit fjerner standard foringer. Slank 1911 foring Driver Bit fjerner tynn foringer brukes for slanke grep. the shoulder of this bit does not allow the blade to seat completely with ed brown bushings, resulting in a rounded off slot on the bushing - exactly what this driver is supposed to prevent. Better job with a perfect sized blade tip from a high quality driver set (I used one from [@]). The driver works fine. Just remember that it is for a Slim Bushing so make sure the bit is on the bushing which itself which is fairly slim (i.e. thin and shallow) to start with. I think this bit works well with most regular 1911 grip bushings also. I bought this bit to have the right tool for the job and finally got to use it on a friend's 1911 that had slim grips and bushings he wanted to change out. The blade is recessed too far and doesn't fully reach the slot. I ended up choosing a suitable blade out of my Wheeler kit like I usually do. Might be able to modify with a file. This tools ability to center the bushing and stay in the slot is wonderful. Before I bought the tool I used a screwdriver and schmucked the bushing. Works great when the bushings on my Series 70 Gold Cup or Series 80 Officers Model need tightening. I have also used it on a Norinco frame without problems. I'm glad I found this bushing bit. Makes 1911 grip bushing removal and installation a breeze. I don't know how many grip bushings I've ruined with a flat head screw driver. This tool makes it so easy to remove and install grip bushings! I messed up a screw and bushing attempting to install a Pachmayr Finger Groove grip on my Colt Government 38 Super. I ordered a set of the stainless bushings along with matching hex screws. Taking the advise of one of the reviewers I also ordered one of these grip bushing tools, which made the removal and installation of the new bushings a snap. This tool made the job of removal & installation of the grip bushing a very simple and uneventful task. Just the way we wanted. The bushings and hex screws looked and functioned so well I removed the three good bushings and used this complete set of bushings and screws. The end result a much better looking 1911 with that stainless steel showing up on the black grip. I would highly recommend the stainless bushing & hex screws and certainly add one of those bushing tools to your order if you do not have one. Though I have used a near perfect fitting screwdriver in the past as the gangster says in "Casino": "Why take a chance"? Have six 1911 frames so I bought both, only finding one that needed the slim bit. Works perfectly with the magna tip driver and engages high enough off the frame so you won't damage it. Well built and probably one of the least expensive specialty tools I've ever purchased. 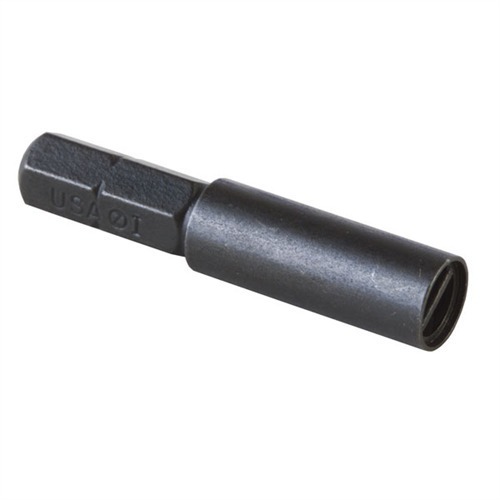 Regular 1911 Bushing Bit Spesielle biter som passer våre Magna-Tip ® og klipp-spissen referanser til riktig center bladet og støtter 1911 grep foringer. Gjør fjerning enklere, raskere og hindrer rive opp sporet. Vanlig 1911 foring Driver Bit fjerner standard foringer. Slank 1911 foring Driver Bit fjerner tynn foringer brukes for slanke grep.